In 12-inch nonstick skillet, heat 2 teaspoons of the oil over medium heat. Cook onions and garlic in oil 5 minutes. Stir in frozen cauliflower; cover and cook 8 to 10 minutes, stirring occasionally, until cauliflower is tender. Transfer to blender. Add whipping cream; cover and blend 60 to 90 seconds or until nearly smooth. Add cheese and 1/2 teaspoon of the salt; blend 60 to 90 seconds or until smooth. In same skillet, heat 2 teaspoons of the oil over medium heat. Season chicken with 1/2 teaspoon of the Italian seasoning and remaining 1/2 teaspoon salt; add to skillet. Cook 7 to 9 minutes, turning occasionally, until chicken is no longer pink in center (165°F). Reserve chicken; wipe out skillet. In same skillet, heat remaining 2 teaspoons oil over medium heat. Add zucchini and remaining 1 teaspoon Italian seasoning; cook 2 to 3 minutes, stirring occasionally, until zucchini just starts to soften; drain in colander, pressing with back of spoon. Add cauliflower sauce and chicken to skillet; stir to combine over medium heat. Stir in zucchini; cook 1 to 2 minutes or until heated through. Top with parsley; serve immediately. 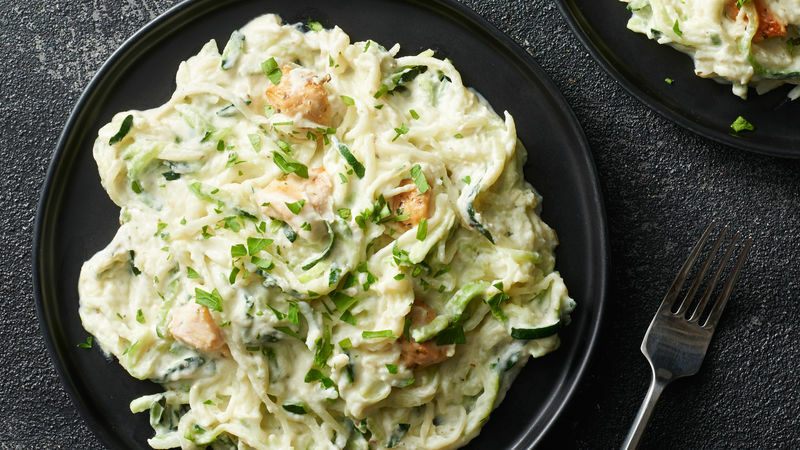 If you’re using prespiralized zucchini that is measured by the ounce, this recipe has about 20 oz zucchini spirals.